If you’ve been making your own bread at home, Kudos to you! If you haven’t but it’s something you’ve always wanted to try, you’re in the right place! You may have heard stories of sourdough starters being passed down from generation to generation. Even that these age old starters can be closely guarded, and well taken care of secrets. Luckily learning how to make sourdough starter from scratch requires neither a centuries old ‘hand me down’, or any special ingredients. 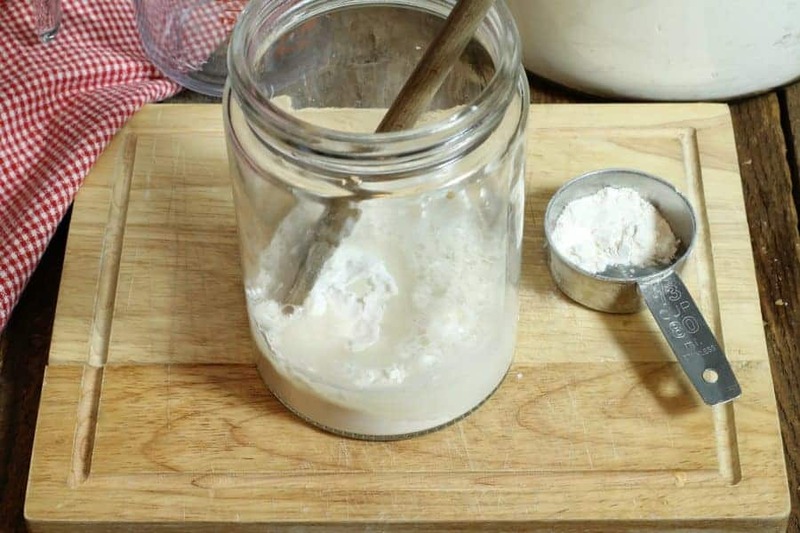 I’ll show you not only how make your own sourdough starter, but also how to properly take care of it, use it to make your own sourdough bread, as well as few tips and tricks I’ve picked up from doing this myself over the past few years. Sourdough bread is essentially the ‘historical’ way of making leavened bread around the world. The very first breads where likely various forms of flatbread, which were made with whatever flour or grain was available in the region. At some point in history, an ‘unlucky’ (or very lucky..depends how you look at it), baker left his dough sitting in a warm spot for too long, and the water and flour mixture would have started to ferment. What a surprise he (or she) must have gotten when upon baking, a soft fluffy bread was pulled out of the oven. This basic method of using naturally occurring yeasts to ferment flour products, was the main method which would have been used up until the early 18th century for baking bread. 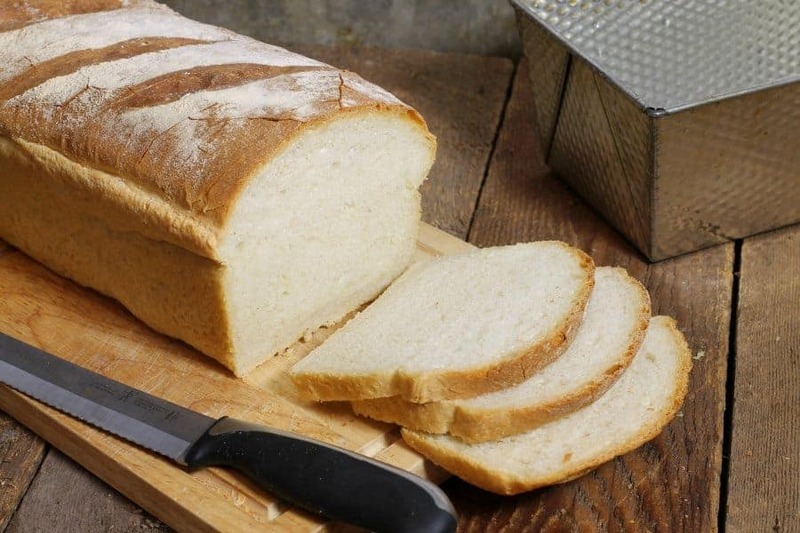 Bakers would not really have had any control over the yeast itself, but strains ‘local’ to an area would have produced differing tastes and textures, especially when re-using old dough’s to start a new batch. This eventually led to the creation of making slurry based yeast starters which often contained barley malt, and various flours. These were often referred to as ‘emptins’ in old recipe books, and where essentially the scraps of the beer making process (left-over wort), mixed with flour. It’s interesting that leavened bread and beer were usually produced in the same regions, as the fermentation process for yeast is similar in nature. In time the ‘Vienna Process‘ for baking and making yeast was invented and bakers would have slowly started using press-yeast, a specially produced yeast meant for baking. Each have a different method of preparation, but in short: both fresh and active dry yeast need to be ‘bloomed’ or activated prior to use while instant yeast may be mixed right into the dry ingredients of the recipe. Modern breads leavened with bakers yeast (such as this white sandwhich bread) have a tenancy to rise (or proof) fairly quickly in comparison to sourdough starters. While this is convenient in a commercial setting, breads using bakers yeast often have less complex flavors and a lighter structure. Sourdough breads are more complex in flavor due to differing wild yeasts, have a slightly ‘sour’ taste due to the fermentation process, and are usually a bit chewier then other breads. Naturally occurring wild yeasts, are present literally everywhere around us. On fruit, in the air, on plants such as wheat, barley, and Einkorn, in dirt and water. When mixed with flour, water, and left in a warm environment these bacteria (specifically lactobacilli) will start to ferment and turn natural carbohydrates present in the flour into carbon dioxide. This is the basis of how a sourdough is made possible. The interesting thing is that, as a starter ferments and is ‘fed’, it picks up strains of yeast local to it’s surroundings and the flour used to feed it. 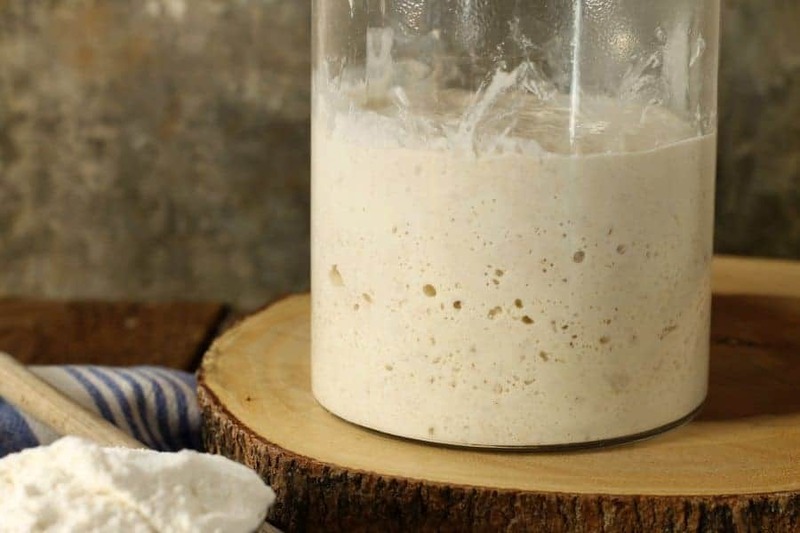 This means that while you may receive a sourdough starter that is ‘so many years old’ and from a specific region, in time, the starter will take on new local strains of yeast until the old ones have all but disappeared. When making your first batch of sourdough starter at home, it’s important to use good quality ingredients. This is the biggest secret to success. The very first time I made my own sourdough starter from scratch, nothing happened. Literally. It went moldy on the counter, and I was left wondering how I could have screwed up something ‘so easy’. I learned that since yeast is a living organism, giving it any old flour and water, will not exactly help it grow and multiply. Most often people have all-purpose flour at home which has been bleached and enriched. Freshly milled flour has a yellow appearance, and as such it is commercially bleached with a bleaching agent, (such as chlorine), to give the flour a white appearance. The bleaching process also makes it easier for the flour to develop gluten while kneading. While this is fine and dandy, bleaching flour may kill the naturally present yeast and other beneficial bacteria. If it doesn’t, the chemical inhibits the growth of other wild yeasts that may be introduced through other means, such as by adding yogurt to the starter (more on that later). For this reason it is best to use un-bleached all purpose flour when making sourdough starter from scratch. Lets get to the knitty gritty and actually make a sour dough starter from scratch! Keep in mind this is not something you will make start to finish in one afternoon. You’ll need about 4 days to properly let the starter ferment and become active. Over these four days you’ll periodiclly feed the ‘sourdough starter’ (about every 12 hours) with more flour and water to encourage yeast production. you’ll notice the sourdough starter start to become gloopy, bubbly, and slightly sour smelling. Start by mixing 2/3 cups (85 grams) of the flour in your non-reactive container with 1/3 cup (80ml) of warm water. Vigorously stir the mixture with a spoon to incorporate air. Scrape down the sides of the container with the spoon, and cover the container with a clean linen cloth or cheese cloth. You want the starter to ‘breath’ and be able to expel the carbon dioxide it produces. If the mixture seems VERY dry add another 1btsp (14ml) of water. The consistency should be paste like, but not runny. Set the container in a corner on your kitchen counter and forget about it for a day. After 12 – 24 hours, it’s time to feed your starter again. Over the past hours, the bacteria present in the flour/air/water should have started to slowly eat the carbohydrates in the flour, and begin fermentation. Depending on the temperature in your kitchen(especially if your room temperature is under 20C or 68F) this may be closer to the 12 hour mark. Essentially the warmer the temperature the faster the sourdough starter will ferment. You may notice one or two lone bubbles in the mixture. Add 2/3 cup of flour and 1/3 cup of water to the starter. Mix vigorously with a clean spoon, and again scrape down the sides and replace the cloth. The sourdough starter should be fairly gloopy and may start to appear gluey. Wait another 12-24 hours. At this point you should start seeing noticeable bubbles trying to break the surface of the sourdough starter. Don’t worry if you don’t, as long as there is no mold, or ‘rotten smell’ everything should be ok.
Feed the starter again with 2/3 cups of flour and 1/3 cup of water. Scrape down the sides of the container, and replace the cloth. At this point another 12 – 24 hours will have passed, and you should be seeing the surface of the sourdough starter look bubbly. The starter may even start to grow in volume, and depending on the temperature may even have doubled in size. Feed the starter one more time with 2/3 cups of flour and a splash of water to maintain consistancy. Sit back and wait another 24 hours. This is it! Your sourdough starter should have at least doubled in size by now. If you are still not seeing any visible signs of fermentation or notice a ‘sour’ smell, it’s a good idea to start over and try keeping the starter in a warmer location to encourage yeast growth. At this point your starter is ready to use in a bread recipe, but if you aren’t quite ready to bake, you can store it in the refrigerator. 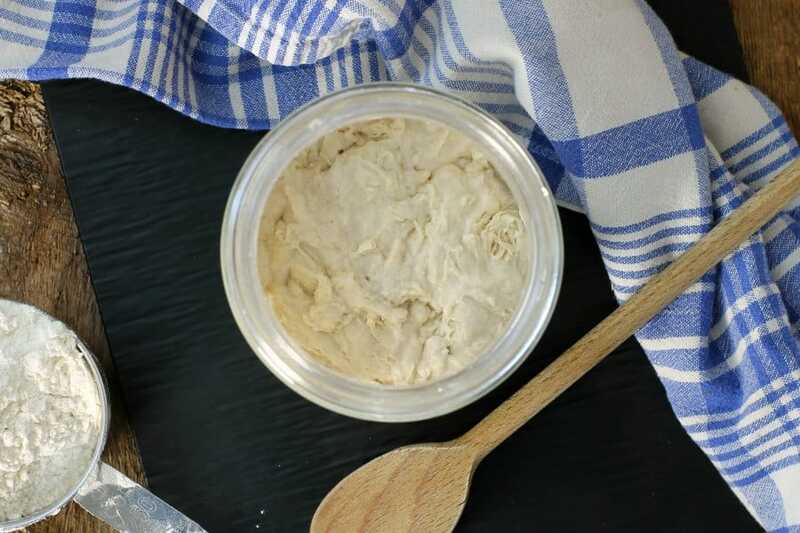 Many people keep their sourdough starters on the counter, but unless you plan on baking every two or three days, I have found it best to keep it refrigerated to avoid the yeast from losing it’s strength. If kept at a warm temperature the yeast will keep eating the carbs in the flour until all the food has been consumed(unless you keep feeding it). The yeast then starts to die and looses its potency. To avoid this, store at least 1 cup of starter in the fridge in a non-reactive container. The cold temperatures will make the yeast go dormant. They are easily awakened by taking them out of the fridge and feeding again with another round of water and flour. If the sourdough is left to sit for a long time, a brownish liquid may appear on the surface. This is normal , and usually a sign of a little to much water in the mixture. Simple pour it off and continue feeding as normal. 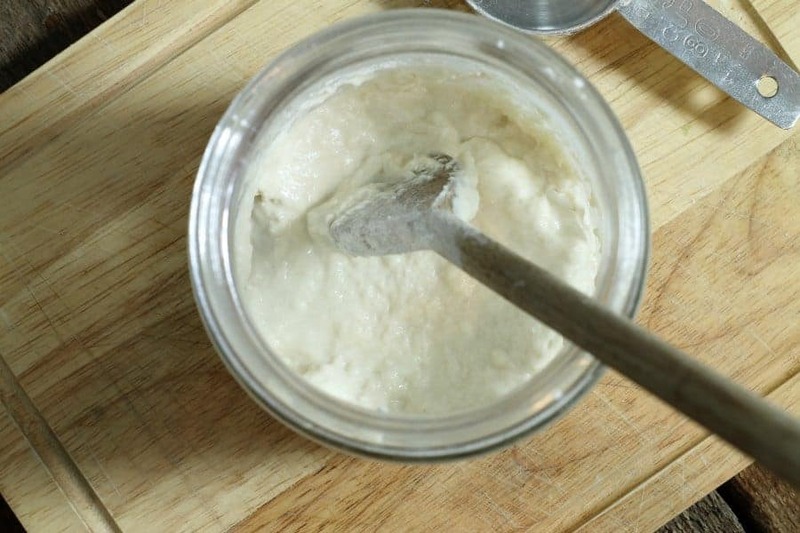 Learn how to make sourdough starter from scratch using only natural, whole ingredients. Easy to follow steps for making fool-proof sourdough bread at home without any special equipment. 2/3 cup Un-Bleached All Purpose Flour Organic is best, but using un-bleached flour is most important. Start by mixing 2/3 cups (85 grams) of the flour in your non-reactive container with 1/3 cup of warm water. Vigorously stir the mixture with a spoon to incorporate air. Scrape down the sides of the container with the spoon, and cover the container with a clean linen cloth or cheese cloth. You want the starter to ‘breath’ and be able to expel the carbon dioxide it produces. At this point You should be seeing the surface of the sourdough starter look quite bubbly, The starter may even start to grow in volume, and depending on the temperature may even have doubled in size. Feed the starter one more time with another 2/3 cups of flour and 1/3 cup of water. Sit back and wait another 24 hours. Your sourdough starter should have at least doubled in size by now. After day 5, if your sourdough is bubbly, smells like sourdough, and isn’t mouldy, it’s ready to use in any sourdough recipe. Simply measure out the amount of starter the recipe calls for and proceed as is required. If using a previously refrigerated starter, simply take the starter out of the fridge a day before you plan on baking. Feed the starter to re-activate it. Once bubbly and ‘active’ it’s ready for use. If after 5 Days are still not seeing any visible signs of fermentation or notice a ‘sour’ smell, it’s a good idea to start over and try keeping the starter in a warmer location to encourage yeast growth. Hi Nova, If you plan on baking bread on Monday, I would suggest not refrigerating it, and instead simply keep feeding the starter until then, the same as you have been doing until now. Bake on monday, use whatever amount of sourdough you need, and then refrigerate any leftover starter. When you are ready to bake again, remove the starter from the fridge and feed it to re-activate it. It’s ready for use again when kit’s actively bubbly. So I’m on day 5 and my starter looks great but I have no idea what to do with it from here. Do I just leave it on the counter? How much and how often do I feed it? What do I do when I take a cup out for baking a loaf of bread? Hi Hannah, I sent you a more detailed e-mail but I will also answer your question here. After day 5 of ‘starting’ your starter, you are basically ready to start using it in any sourdough recipe you like. Any leftover sourdough can simply be refrigerated for future use. When you are ready to use it again, take it out the day before, feed it ‘as normal’ and let it become active again before using. You can repeat this process as many times as you like. If you notice mould growing inside the container, you should throw it out and start over. I had that exact question! I’m on day 5 and wondered “what do I do now?” Thanks! Wow this is such a great tutorial. I wish I had it back when I was just starting out with my sour dough starter. You have made it so easy to understand! Thanks Aleta! I’m glad you where able to tackle making sourdough at home yourself! I’ve been making bread for a few years now and have been wanting to give the sourdough starter a go! Well I’ve finally done it! I’m about to feed it for the 2nd time and already saw a few bubbles! I just always came across different “recipes” and instructions for keeping and caring for the starter. This one seems easiest. I am eager to make my own sourdough bread as it is my favorite! Thank you for this recipe. Your steps are very clear. I am on day 3 of my starter and it has almost doubled in size by the next day, but fell during the day…is this bad? It’s not necessarily bad, it could be that the starter simply used up all the food you gave it, it goes faster and faster, the larger the starter gets, try feeding it again and see if it still bubbles and doubles up again! Make sure it isnt to liquidy either. Should I be throwing away any of the starter when I feed it? Or just adding to what I already have? Hi Moriah, Don’t throw any of the starter out, just add to it each day as you initially get it going. If you throw any out you risk reducing the bacteria count, and then it will take even longer to become forthy and bubbly. Once the starter is going dtrong, you can take some ‘out’ for use in recipes, such as my no-knead sourdough bread, and simply refrigerate the rest. Once you plan on using the starter again, simply take it out , feed it, and then let it sit overnight to re-activate. I hope this helps! If you are pulling the starter out of the fridge to use in pancakes, you’ll need to feed it first to activate it. I have never used sourdough starter in pancakes though! I would just take out two cups and feed it, and wait for it to become active again. Then measure out two cups of active starter to use in your recipe. To feed the two cups cold starter you would only need 2 or 3 tbsp of flour and a splash of water to get it back to the proper consistency. I’ve just tried this recipe for the first time. The dough is on the counter proofing for the night, we’ll see how it turns out tomorrow! 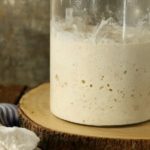 I’m just curious to hear your thoughts on other sourdough starter recipes. Any other starter recipes I’ve read instruct you to throw away a portion of the fermented starter each day before adding more flour and water (this always seemed kind of wasteful and complicated to me). Do you know whats the reason behind the discarding each day? I was interested to try your recipe because it was the first one I’d come across that didn’t look like you needed to be a bread guru to have success with it. Thanks Myra, I’m glad you found the instructions easy to use. I’m not sure why other recipes tell you to discard part of it. To me this also seems wasteful. The only reason I can think of is that it’s meant to prevent you ending up with a huge amount of starter. I’ve also seen other recipes use yeast to help kickstart the process but this seems counter intuitive to me. As I mentioned though its important to use unbleached flour and un chlorinated water to be successful in breeding the bacteria. Basically once your starter is ready to use, use what you need and put the rest in the fridge to put its growth on hold. Next time you go to bake, take the starter out and feed as you did here. After 2 feedings it should be ready to go. Anywho, happy baking! I always enjoy reading the bits of history/extra information on recipes that you include in yours. hi Mark – excited to try this recipe, but not sure if I am supposed to mix the entire 1 1/2 cups starter with the sourdough ingredients, or hold back 1/2 cup for future use and feed it, and use just 1 cup of the bubbly starter. (i might have missed something in the instructions, but i’m confused) Thanks!!!!! Use the entire 1.5 cups of the starter! My error, thanks for pointing it out! I’ve never done a sourdough starter before. I am starting this for a fund raiser breakfast for dinner and was wondering if I can continue adding to the starter to make sure I have enough. If not could you please give me some pointers! Hi Linda, if you are just trying to make a bigger batch of starter, yes just keep feeding the starter with more flour, add enough water to make it floppy and then let the starter get to work. Eventually the entire mass will turn into a starter once the bacteria has had a chance to multiply. You can yes , though for your first sourdough starter I would suggest using all purpose instead of whole wheat as whole wheat an create weird tasting starters due to a bigger variety of wild yeasts. After mixing the first 2/3rds flour and 1/3 cup water the mix should be fairly doughy and thick. Almost like a thick pancake batter. As the yeast start to eat the carbohydrates and bubbles start to appear it will thin out a little. It should not be watery. This is great information. I tried making a sour dough starter before but it exploded on me the first night. What a mess! I kept my starter in my microwave, since we rarely use it. Your step by step instructions are great! Can’t wait to try again. Ouch! I had my starter bubble over the first time I made it as well. I was very surprised at how quickly it starts to double in size! What a good post Markus! You explained so well that I think I’m going to put my fear away and try to make sourdough bread. I baked traditional bread but never try sourdough. As I’ m gluten intolerant I make bread for my family… But I love bread! Could it be possible to make sourdough without gluten? Or at least make bread with a flour with less gluten like kamut using your sourdough recipe? I am not sure if a ‘sourdough’ style starter would work with kamut. It’s worth a try! I know that my mother is sensitive to processed flours, but my parents make bread with an organic whole white flour from Spearville Mills. While it still contains gluten, it’s a heritage breed, not as processed as grocery store flour, and it seems to not bother her at all.If you do try it with a gluten free flour I would love to know if it works! Wonderful post! Many years ago, I made my own starter but stopped and have been wanting to get back at it ever since! Wild yeast are so good and much better than commercially made yeasts (which nowadays is often GMO). This wild fermentation is exactly what our bodies need. Thank you for explaining all this information! I am SO doing this Markus! I love sourdough bread and have thought of making it myself so many times. These detailed instructions and tips for success are exactly what I need to give me the confidence. Pinned for my next baking project! Please share how it turns out! With proper planning, making sourdough really is quite straight forward. I have always wanted to make bread and even took a class once, but I have aril been to nervous to try. Your recipe is very thorough and clear and I look forward to giving it a go! 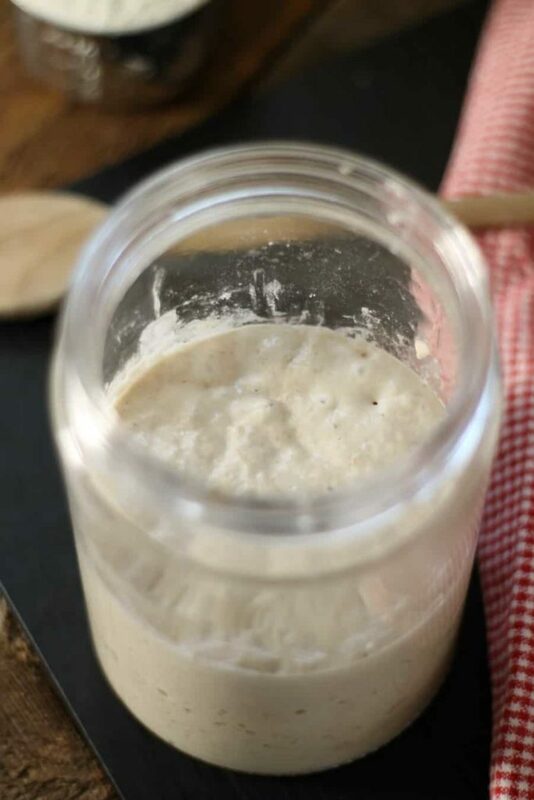 I would love to hear how your sourdough starter turns out! I’ll be posting a ‘sourdough bread’ recipe next week to show how it’s actually used!